My Mothers Day wish was to get out and take photos. Well, that is actually my wish every weekend, but I had a destination in mind this particular day. 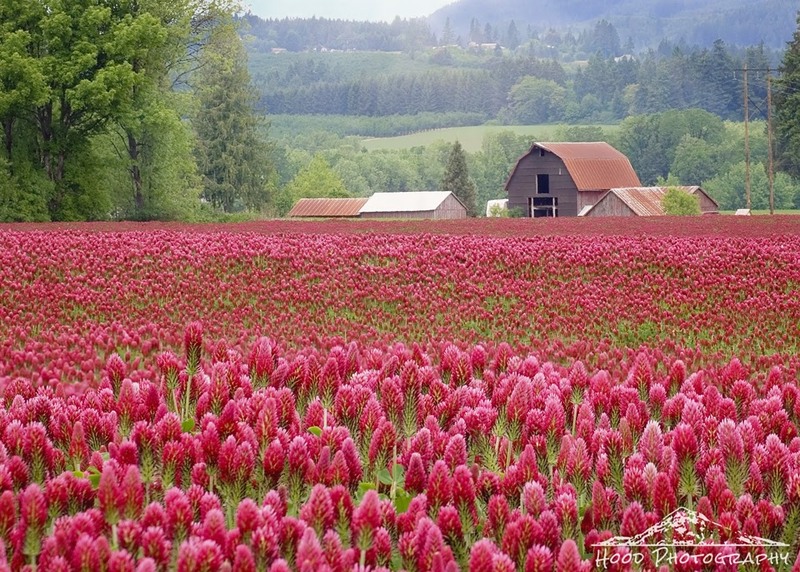 I knew that the crimson clover fields were in full bloom this time of year. We headed west towards the town of Forest Grove, Oregon, and winded along the back roads to the north west of the town until we came across this amazing landscape. The huge red field was buzzing with bees and the old farm in the middle just added to the scene. (PS) Thank you so much to my brother for getting the old "Crimson and Clover" song stuck in my head for days. OMG - that is stunning. It almost takes my breath away! What an amazing view of this beautiful colour. A stunning landscape. Oh wow, what a beautiful sight... Such a pretty color, awesome photo.. Very beautiful!! Great color my fav! Those fields are gorgeous. We found a field on the way from Salem to Dayton a couple of weeks ago. I planted some in my garden a couple of years ago and still have some coming up. Blooming now. Never in my life have I seen such beauty. So glad you shared with us. Awesome! LOL! Crimson and Clover was one of the very first 45 records I had when I was younger! And now....thank YOU for getting it stuck in my head. Your clover fields are stunning. The color is almost surreal! The essence of spring. Love this season that helps one appreciate our surrounding beauty. oh wow... that is a stunning shot.